You didn't get any cake at the party? Karen The guests ate it all before you got there? Oh don't worry! I made another one and there's a piece waiting for you. You're going to like this cake so much that you will want to make your own. So I'm sharing the recipe with you. First, let me say that I found this cake on Pinterest. It is Trisha Yearwood's Key Lime Cake - from her cookbook and Food Network. The original blog post had a few changes - that I didn't do - and I have a couple of changes of my own. 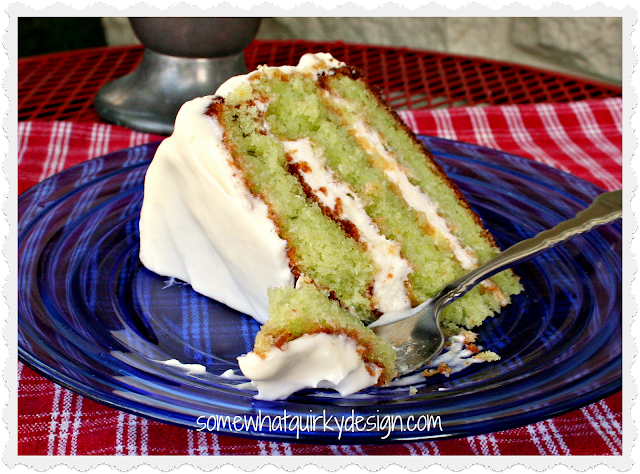 So let's say that this is adapted from Trisha Yearwood's Key Lime Cake. I will put my changes or notes in color you can know what I changed. In a large mixing bowl, mix the gelatin, sugar, flour, salt, baking powder, and baking soda. Stir to mix well. Add the eggs oil, orange juice, lemon juice, and vanilla. Divide the batter evenly among the three pans and bake for 35 to 40 minutes. (this layers are pretty thin, and this is way too long to cook the thin layers - the second cake cooked in 30 minutes and possibly could have cooked a few minutes less) Cool the layers in the pans for 5 minutes, then turn them out onto racks. Whip the whipping cream and put it away in the fridge (I did this before I started making the cake). Cream the butter and cream cheese. Beat in the confectioners' sugar until the mixture is smooth and easy to spread. I added lime zest to the icing in the second cake-about 1 tbsp. It just looks pretty. 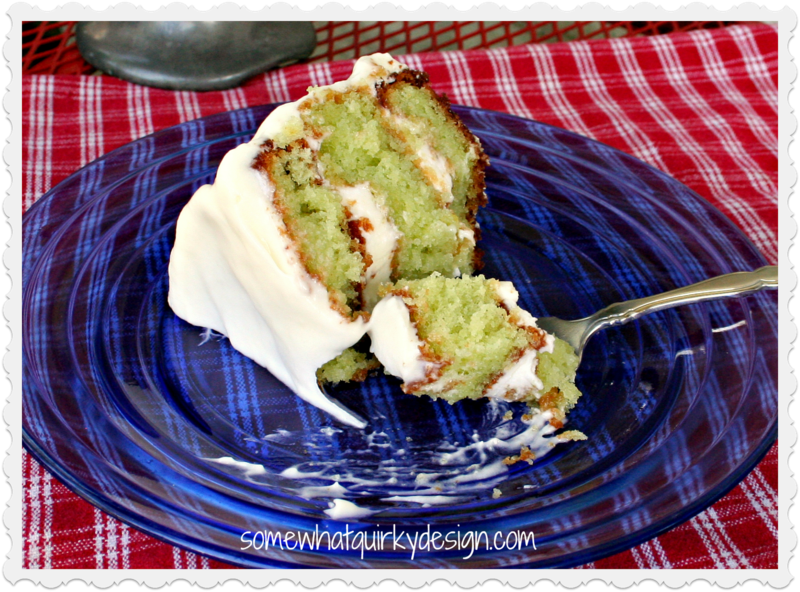 Spread the icing between the layers, the sides, then the top of cake. Note 2: If you can find key limes use them - we really liked the tartness. This cake is delicious! It is really hard to just eat just three one pieces. I think I'm going to make it without icing next time (this is a big deal for me because I like a little cake with my icing) and serve it with whipped cream. This looks and sounds so delicious for a hot summer day. Wish I was closer. I would invite myself over for a piece. Oh my, my mouth is watering! My fear - those three pieces! I think I'll wait to make it for my house guests next week-end. Holy Moly this cake looks like a beast-- full of yumminess!!!!! WOW! Thank you for sharing this! !